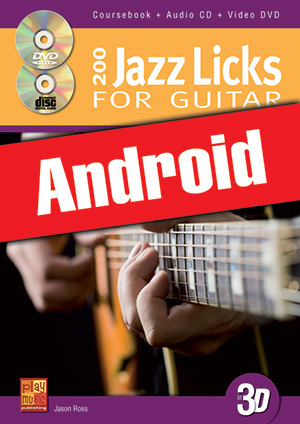 200 Jazz Licks for Guitar in 3D (Android) (GUITAR, Courses for Android, Jason Ross). With its 200 licks and phrases, conceived by the most famous guitarists, this coursebook is a veritable Jazz-cyclopedia imperative for everyone working on Jazz. The licks in this coursebook are thematically classified into: Blues licks, licks over Maj7 chords and min7 chords, licks over dom7 chords and alt7 chords, licks over major II-V-I and minor II-V-I progressions. This classification will allow you to easily assimilate them and subsequently enable you to use them in other contexts (keys or chord progressions) so you can begin to develop your own ideas. To make your learning more enjoyable, each lick comes with a corresponding video recording on the DVD and one or more applications on the CD. By helping you to appropriate the vocabulary and rhetoric of Jazz, this coursebook will develop your musical prowess and your improvisational skills. Since you are dealing here with the Android version of the tutorial, the book, the CD and the DVD have been replaced by a tablet-optimized multimedia pack containing musical sheets, texts, audios and videos.